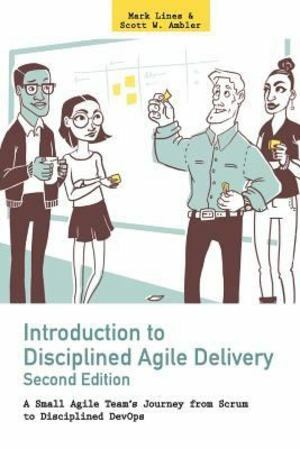 Introduction to Disciplined Agile Delivery 2nd Edition provides a quick overview of how agile software development works from beginning-to-end. It describes Disciplined Agile Delivery (DAD), the first of four levels of the Disciplined Agile (DA) process decision framework, and works through a case study describing a typical agile team's experiences adopting a DA approach. The book describes how the team develops the first release of a mission-critical application while working in a legacy enterprise environment. It describes their experiences from beginning-to-end, starting with their initial team initiation efforts through construction and finally to deploying the solution into production. It also describes how the team stays together for future releases, overviewing their process improvement efforts from their Scrum-based beginnings through to a lean continuous delivery approach that fits in with their organization's evolving DevOps strategy.The DAD framework is a hybrid of existing methods such as Scrum, Kanban, Agile Modeling, SAFe, Extreme Programming, Agile Data, Unified Process and many others. DAD provides the flexibility to use various approaches and plugs the gaps not addressed by mainstream agile methods. In a nutshell, DAD is "pragmatic agile." DAD describes proven strategies to adapt and scale your agile initiatives to suit the unique realities of your enterprise without having to figure it all out by yourself.Here's an overview of what each chapter covers:Chapter 1: Introduction. This chapter provides a quick overview of the book and a brief history of Disciplined Agile.Chapter 2: Reality over Rhetoric. This chapter explores several common myths about DAD and more importantly disproves them.Chapter 3: Disciplined Agile Delivery in a Nutshell. This chapter provides a brief yet comprehensive overview of DAD. Chapter 4: Introduction to the Case Study. This chapter introduces us to the team, describes the market opportunity that they hope to address, and describes the environment in which they're working.Chapter 5: Inception. The team's initiation effort includes initial requirements modeling and planning with their stakeholders in a streamlined manner, initial architecture modeling, setting up their physical work environment, setting up the start of their tooling infrastructure, initial risk identification, and finally securing stakeholder support and funding for the rest of the first release.Chapters 6 through 10: Construction. These chapters each describe a single Construction iteration, sharing the team's experiences during each of those two-week timeboxes. Chapter 11: Transition. The two-week transition phase focuses on final testing and fixing, training the support/help-desk staff, finishing a few short end-user "how to" videos, and deploying the solution into production.Chapter 12: The Road to Disciplined DevOps. This chapter overviews the team's improvement efforts over the next few releases, describing how they evolve from the agile Scrum-based lifecycle to a leaner approach and eventually to continuous delivery. All of this dovetails into their organization's efforts to implement a Disciplined DevOps strategy.Chapter 13: Closing Thoughts. This chapter overviews the disciplined agile resources that are available to you.Appendix: The Disciplined Agile Framework. This short appendix overviews our ongoing work on the Disciplined Agile framework to address the full scope of an agile business. At 111 pages, you should find this book to be a quick, informative read.What's Different in This Edition:Chapter 3 was completely rewritten to reflect the changes to DAD. Chapter 12 was rewritten to describe how the team evolved into a Disciplined DevOps strategy. Appendix A was rewritten to reflect the latest release of the DA framework. General updates were made throughout the book.